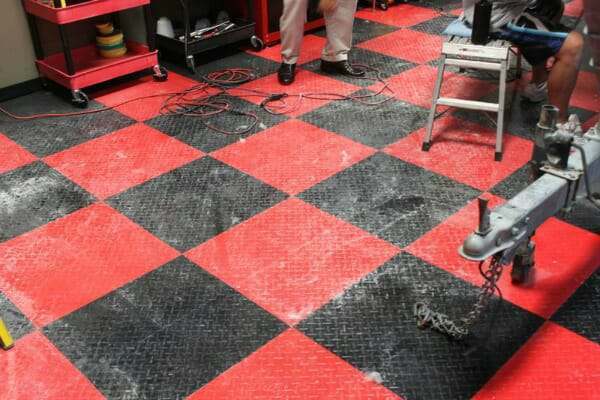 If you have an interlocking tile garage floor or you are considering purchasing one, then we are sure you have heard how easy they are to maintain. But do you really know how to clean interlocking floor tiles? Because of the material that these tiles are made of, it’s important to know the correct way to clean and maintain them properly to insure the best results. To be clear, the tiles we are referring to are the high-impact plastic polypropylene garage tiles by manufacturers such as RaceDeck, Swisstrax, Big Floors, and TrueLock just to name a few. If you are inquiring about the softer rubber-like PVC tiles, we will be discussing those in a future article. 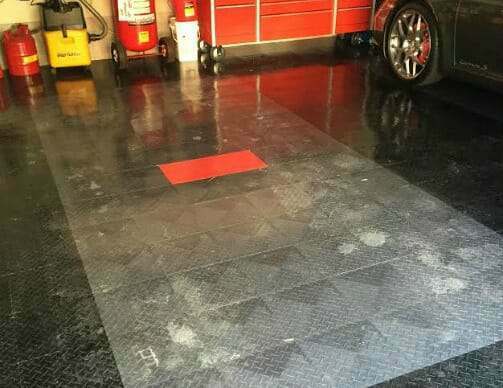 Do interlocking garage floor tiles get dirty? This might seem like a silly question at first. Of course the tiles get dirty, but they don’t get dirty in the way that you may think. Because these tiles are made of high-impact non-porous polymers (hard plastic), the dirt and grime that they collect sit on top of the tiles and not in the tiles like it would with bare concrete or other semi porous flooring products. This is the primary reason why it’s extremely difficult to stain most polypropylene garage tiles. Since dirt and grime tend to sit on the surface and not in the surface, the cleaning techniques and products used are slightly different than other garage flooring options. For routine cleaning maintenance of interlocking garage tiles, there are a few items that work very well. The first is a dust mop. Because the dirt and dust that routinely collects in a garage sits on top of the tile, a dust mop works very well for wiping up the light stuff on a regular basis. This is especially true for the darker colors, such as black and dark gray, that tend to show dust and foot prints more than other colors. Another would be the use of a soft bristled broom. These do well at sweeping up the finer dust and dirt that can collect on top of the tile as well as picking up larger debris.
. These work well because the brushes tend to loosen up any heavy or dried dirt that was brought in on wet tires and shoes as well other debris. They also work especially well on the free flow, self-draining style of tiles. The brush works to break loose dried mud and debris that may have attached itself to the ribs of the tile. We don’t recommend using the standard floor attachment without the brush however. The reason is that sandy dirt and debris that is rubbed between the tile and the floor attachment can cause microscopic scratches to the surface of the tile which may dull the finish over time. As easy as it is to maintain these floors, there will come a time when the floor needs more than routine maintenance from a broom or vacuum. We are talking about cleaning the mess left over after a snow fall or heavy rain. This can also include the occasional scuff marks, black tire marks, stubborn grease from working on your cars, and the general mess that gets tracked around from that weekend project that you just completed. For general cleaning, mop interlocking tiles with an ammonia based non-sudsing floor cleaner such as Mr. Clean. These cleaners are usually streak free, they do not leave a film on the floor, and they do a good job of bringing back the shine. Stay away from sudsing film forming cleaners as these will act like a magnet on plastic and attract dust and dirt that will only increase how often you need to clean or sweep. Buff out any scuff marks that mopping did not remove with a rag or soft scrub pad dipped in your cleaning solution. A short bristled deck brush is also great for scrubbing the more stubborn marks while you mop as well. Another product that does a great job is waterless wash concentrates that detailers use for cars. Use just 1 ounce of concentrate to 2 gallons of water. These waterless cleaners will not streak or leave a residue and will leave your interlocking tiles looking shiny clean. This interlocking tile floor was filthy after the AutoGeeks finished with it. You can see how they cleaned it with a waterless wash concentrate here. For the more stubborn and difficult to remove tire marks, grease, and general smudges, use a few drops of solvent such as mineral spirits or Goof Off on a rag. Do just small areas at a time and do not attempt to clean the entire floor this way. To our knowledge, RaceDeck is the only company that actually offers a commercial cleaning kit for interlocking tiles. The kit includes their pH balanced All-Purpose cleaner, Scuff Remover, Restore, and Renovator Cleaner. Their Restore solution is particularly interesting. According to RaceDeck, it’s an acrylic solution that you mop on after cleaning that will bring back the life and shine to high traffic areas of your floor. We have not had the chance to try it out ourselves, but we have heard positive feedback from consumers who have used Restore. When we contacted RaceDeck they said their cleaning kit line was designed to be used on all RaceDeck polypropylene tile products as well as similar interlocking tile floor products from their subsidiary company Big Floors. When asked about using their product on interlocking tiles from other manufacturers, they suggested contacting the manufacturer first to check for compatibility. 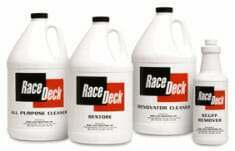 You can find more information about the RaceDeck cleaners here. If you are ever unsure about what products to use or how to spot clean a particular contaminant on the tile, always test it first in a small area or consult the manufacturer. Knowing how to clean interlocking floor tiles can make a big difference in how happy you are with your garage floor. If you follow these cleaning and maintenance tips you should have a worry free floor that will look great for years to come. Regarding cleaning of polypropylene floor tiles, I did a little experiment with a “magic eraser” type of sponge on my Racedeck Tuffshield floor. Had some cutoff leftovers in black and white. DON’T DO IT. The mild abrasive texture of the sponge took the finish right off the black tiles, completely dulling it. Not very noticeable on the white but basically would ruin the black finish. Stick with mild microfiber towels or non abrasive sponges and cleaning solutions as mentioned in the above article. Great advice Ron and thanks for making people aware of what can happen if you get a little too creative. You did the right thing however by testing first on cut offs. I just discovered the PERFECT cleaner for my white tiles! Spray on some Eagle One A2Z All Wheel and Tire Cleaner (avail on Amazon or most car parts stores), wait a minute, then a little elbow grease with a microfiber towel and voila! !